Synopsis: Captain America, Steve Rodgers, returns to fight a new world order, in a modern world. When a S.H.E.I.L.D. colleague is attacked, Rodgers joins forces with Natasha, The Black Widow and Sam Wilson, The Falcon, as H.Y.D.R.A., once again tries to dominate the planet. Review: In the much anticipated return of Captain America, MARVEL has made one of the best movies so far, in their superhero war chest. The movie is non-stop action from beginning to end, the story is a tightly scripted action thriller, and there are enough laughs and back-story references to please any fan. In this sense the movie succeeds at bringing the old Captain America into relevance in today’s world. The fun begins with a murder mystery, when Nick Fury is presumably assassinated; Captain America follows a trail with fellow agent The Black Widow. Along the way are many surprises and twists. His old friend Bucky Barnes returns as a ruthless assassin working for H.Y.D.R.A, with a mission to kill the good Captain. 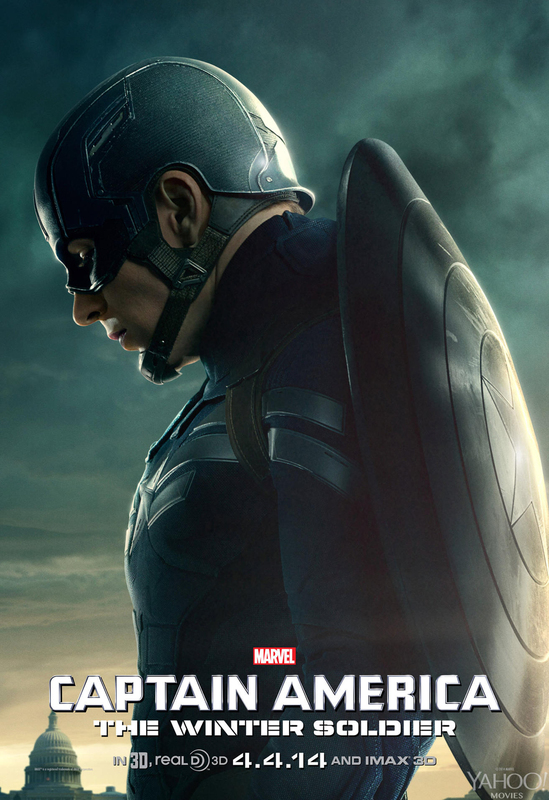 Steve Rodgers befriends a young soldier Sam Wilson, whom he trusts, and who admires him and his American values. Robert Redford as Alexander Pierce represents S.H.E.I.L.D and is the money man who funds the operation through influencing a tight knit consortium of world leaders. Can he be trusted….? Is Nick Fury, really dead, will Bucky remember his friendship with Rodgers, will Stan Lee have a cameo? In the bigger picture, Fury has built a secret arsenal underneath S.H.E.I.L.D headquarters. H.Y.D.R.A has been secretly funding the project through Pierce. When Fury figures this out, he confides in Rodgers and hands him a UBS storage disk that contains all of S.H.E.I.L.D’s secrets and in his presumably dying breath tells Rodgers not to trust anyone. The story continues along this line, as Rogers forms a team with Natasha and Sam. There are cameo appearances by Gary Shandling, (comedian, The Gary Shandling Show) as a corrupt senator working for H.Y.D.R.A as well as the obligatory Stan Lee moment. MARVEL stories always have a human touch and the relationships between the characters ring true. When The Black Widow flirts with the Captain, you can see what she is thinking inside. Rodgers is all about Truth, Justice and the American way and obviously thrives on trust and loyalty, Fury is all about distrust, protecting freedom and always ready to fight. The newbie to this scenario is Sam Wilson, The Falcon, whose loyalty to the Captain’s cause makes him a trusted and valuable friend. This is a story loaded with intrigue; in fact some of the gadgets and technology are slightly reminiscent of James Bond films. The film has left enough loose ends to make a sequel, as with all good movie franchises, it also ties up the some unanswered questions from the first movie. I must say, watching Robert Redford play the heavy, with his charm and understatement, makes him more insidious as opposed to over the top as most Bond villains are. He was perfectly cast and just how insidious he is, surprises you at various tense moments throughout the story. I saw the 3D version of this movie and felt the effect never distracted, that said, the movie would be just as enjoyable with or without the 3D. I hope MARVEL can keep up the good works and future movies in the franchise, such as the AVENGERS sequel, will live up to the bar as raised by this one. Synopsis: Norse God Loki, brother of the hammer wielding Thor , steals the Tesseract, the all powerful gamma ray infested cube of power and portal to the Norse realm, in order to enslave the earth and all its people. Nick Fury leader of S.H.I.E.L.D, an international secret organization designed to defend the earth against military attacks, restarts the abandoned Avengers Initiative by calling upon Captain America, Iron Man, The Hulk, Black Widow and Hawkeye to stop Loki from sending for his army and enslaving mankind. In theaters in 3D and 2D. 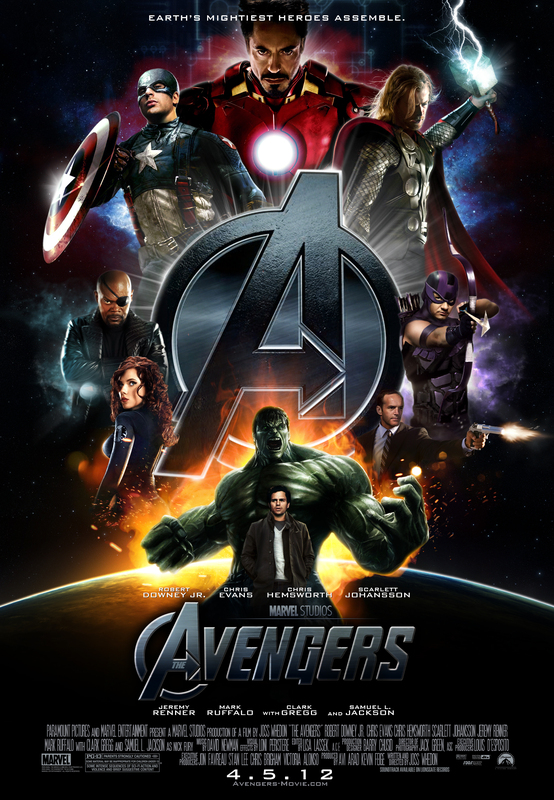 Robert Downey Jr. reprises his role as Tony Stark/Iron Man for the third time, Chris Evans reprises his role as Steve Rodgers/CaptainAmerica as does Scarlett Johansson reprising her role from Iron Man 2 portrays Natasha Romanoff/Black Widow, Chris Helmsworth as Thor, Samuel L. Jackson as Nick Fury, Gweneth Paltrow as Pepper Potts, Clark Gregg as Phil Coulson and Stellen Skarsgard as Erik Selvig With newcomers Mark Ruffallo as Bruce Banner/Hulk and Jeremy Renner as Clint Barton/Hawkeye rounding out the cast. Review: Having grown up on Marvel comics and also enjoying the previous films that led up to The Avengers I went into the film with much anticipation and I was not disappointed. The film is a blend of action summer blockbuster, sci-fi, and family relationships all held together by enough humor to captivate and at the same time not take itself too seriously. The story starts out slow then takes off at the arrival of Robert Downey Jr.’s Tony Stark. The first 30 minutes or so are taken up by Loki’s arrival on earth to steal the Tesseract from S.H.I.E.L.D headquarters after that the fun begins. Tony Stark’s character is given all the smart, sarcastic and pompous things to say and his interactions with the serious Captain America as well as the other Avengers really gives the film a sense of humor. Marvel heroes have always been multi – layered individuals who are not only fighting the war but are continually struggling with their own internal battles, it is this human connection that keeps you rooting for them and going back to watch them film after film. Look for the Hulk having a smashing time with Loki and his hordes, the interpersonal relationships as they develop between Thor and his brother Loki, and the the entire Avenger’s Team. Also see if you can find Marvel comics founder, Stan Lee’s cameo. The film has enough going for it to please everyone including fan-boys, comic geeks and those of the general audience. This is solid entertainment and of course sequel worthy. The film already generated over 200 million in box office overseas and will probably surpass that figure here in the states. As far as the 3D experience goes the film that set the pace for the others in total 3D immersion was of course John Cameron’s Avatar. The use of 3D worked best during the war scenes between Loki’s army using New York City as the battleground, otherwise I would have to say save your money and see it in 2D you won’t be missing much but do see it. I couldn’t help but the remember my favorite comic book as a teen NICK FURY AGENT OF S.H.I.E.L.D as written and drawn by the great Jim Steranko, let’s just say Nick Fury was not Samuel L. Jackson. That said Jackson plays it perfect and for those who don’t have a memory such as mine he is the new face of Fury.